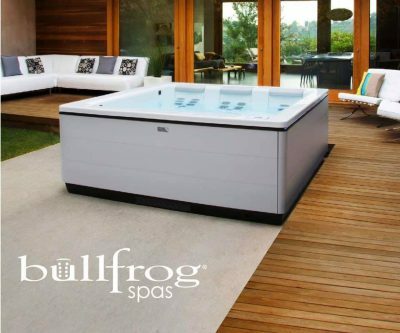 With multiple spa brands in the market, we proudly showcase, sell and service Bullfrog® Spas for the quality, versatility, and simple enjoyment this brand provides. No other hot tub is truly customizable like the Bullfrog® Spa with JetPaks that cater to your specific therapeutic and relaxation needs. Choose what size best fits your needs. Size may vary depending on the number of people you are looking to accommodate. Decide if you want a lounger or a non-lounger. If unsure, try each model to see what you like best. TIP – Our 1# seller is our double lounger. Bullfrog® Spas products do not contain any wood elements in their structure. Bullfrog® Spas’ injection molded frame and base eliminates rotting and water logging, and deters rodents and insects. Its unique JetPak system requires no plumbing, and uses a full foam process to create optimum energy efficiency and structural support.